Christmas is obviously in full swing around here. Brittany wanted to go all out with chocolate this past weekend – she wanted to make brownies and fudge. Not just plain fudge, either – she wanted to make peanut butter fudge too! So I stocked up on chocolate, experimented with my tried-and-true gluten-free brownie recipe (making it dairy-free by substituting 7 tablespoons of palm shortening for the 8 tablespoons of butter – easy peasy! 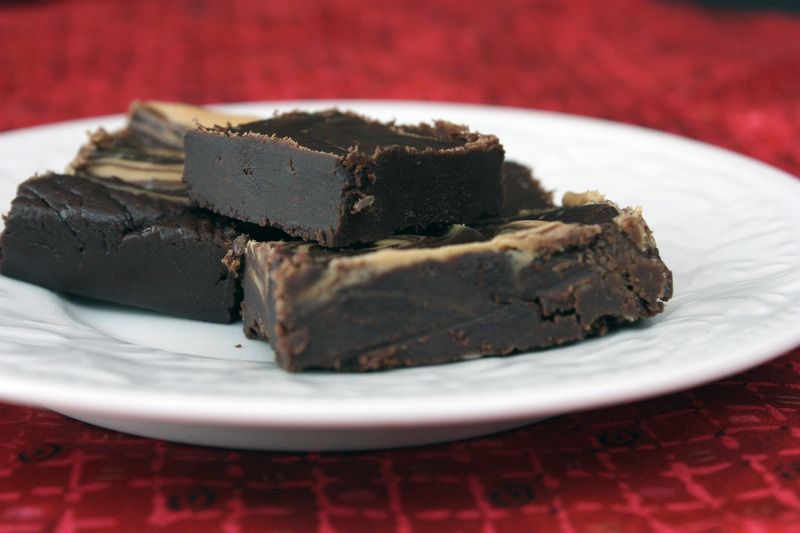 ), and located my soon-to-be favorite fudge recipe over at Go Dairy Free. I opted to lower the sugar just a tad (not that it’s a low-sugar recipe by any stretch! ), but otherwise followed the recipe pretty closely, making improvisations for the peanut butter variety. What resulted was an intense, rich, creamy, dreamy fudge. The peanut butter variety was even more crave-inducing, and was the favorite of all three kids (and John, who savored his piece.) It was a breeze to make, and will definitely be a recipe I’ll turn to time and time again. If you’re looking for a last-minute holiday candy to bring to a party, give as a gift, or just to set out for the family to enjoy, this is definitely one to consider! Lightly grease an 8X8 inch square baking pan. Set aside. Set a stainless steel bowl over a small saucepan with an inch or so of simmering water. Place chocolate chips, margarine, and coconut milk and melt, stirring occasionally. Add sugar and cocoa powder and stir to incorporate. Remove from heat and stir in vanilla extract. Pour everything into your prepared pan and spread out evenly. Let cool completely before cutting into squares. Set a stainless steel bowl over a small saucepan with an inch or so of simmering water. Place chocolate chips, margarine, and coconut milk and melt, stirring occasionally. Add sugar and cocoa powder and stir to incorporate. In a microwave safe bowl, heat peanut butter until softened, about 30 seconds. Stir in remaining tablespoon of confectioner’s sugar. Remove fudge mixture from heat and pour everything into your prepared pan and spread out evenly. Scoop the peanut butter and place on top of fudge mixture in spoonfuls. With a butter knife, drag the peanut butter around the fudge to make swirls. Let cool completely before cutting into squares. This giveaway is now closed! Check out the winners – announced over at The W.H.O.L.E. Gang. 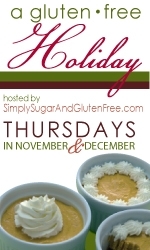 While you’re there, read this week’s theme for Gluten-Free Holiday – Favorite Holiday Entrees and Side Dishes! ﻿ Gluten-Free Holiday is off to a roaring start! Ricki at Diet, Dessert and Dogs kicked us off with tips to stay healthy during the holidays and shared some delicious truffles. And last week, Shirley at Gluten-Free Easily shared a no-fail pie crust recipe that I’m dying to try, and we linked our Thanksgiving favorites. And as you probably are aware, there were some excellent cookbooks given away at Gluten-Free Easily as well. and Ariana Anderson of The Frugally Rich Life. Congratulations to the winners! I will also be offering up some excellent cookbooks for this week’s theme – Gifts of Good Taste. But more on the giveaway in a minute. Yes, I realize that Thanksgiving isn’t even here yet, and I’m already discussing edible holiday gifts. But if you’re like me, you love to plan ahead and have a lot of wonderful gift ideas ready to go. (or are reading this, hoping to gain a few ideas!) This week’s post does exactly that – it allows us to all share delicious, gluten-free edible gift ideas! Food is so often an emotional thing. 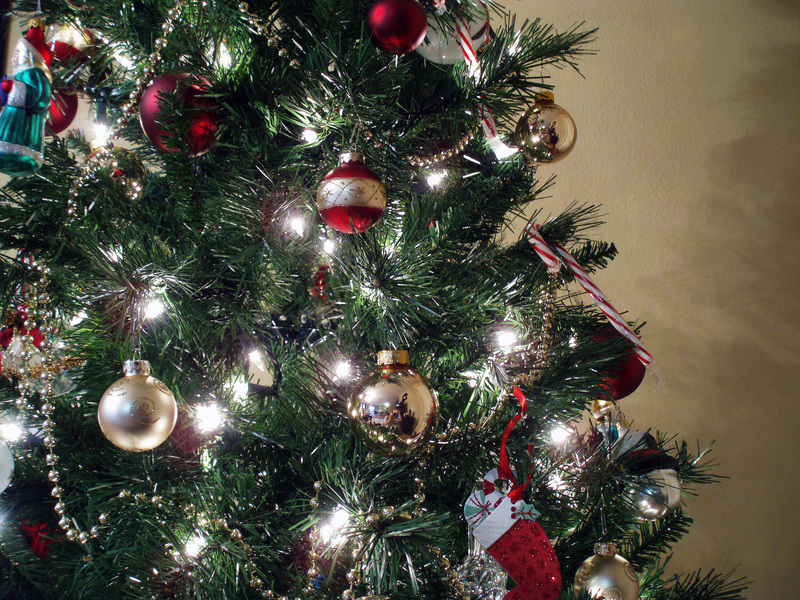 There are traditions that often go back for generations, especially around the holidays. Grandma bakes her famous pie, Mom makes the turkey “just so”, and of course, the endless casseroles, sweet potatoes, and other dishes comprise the meal that defines every family’s tradition. But it doesn’t stop there. Holidays are surrounded by gifts, and many of those are edible. But as most of us with food intolerances or allergies are aware, we can’t just eat “any ol'” cookie or treat shared at the holiday season. So when someone makes a special “safe” treat, it’s that much more special. It’s truly a gift of love. This is often where my true passion for gluten-free cooking shows. It’s around these times that people yearn for comfort, for family, for tradition. So this is when I work to present those who are dear to me something special and safe for them to eat, no matter their food restrictions. I want my family and friends to feel loved and feel as though they can still enjoy the holiday with as much celebration as they ever have. So I cook, and I bake. Today, I have a few treats to share that would delight any gluten-free friend or family member. 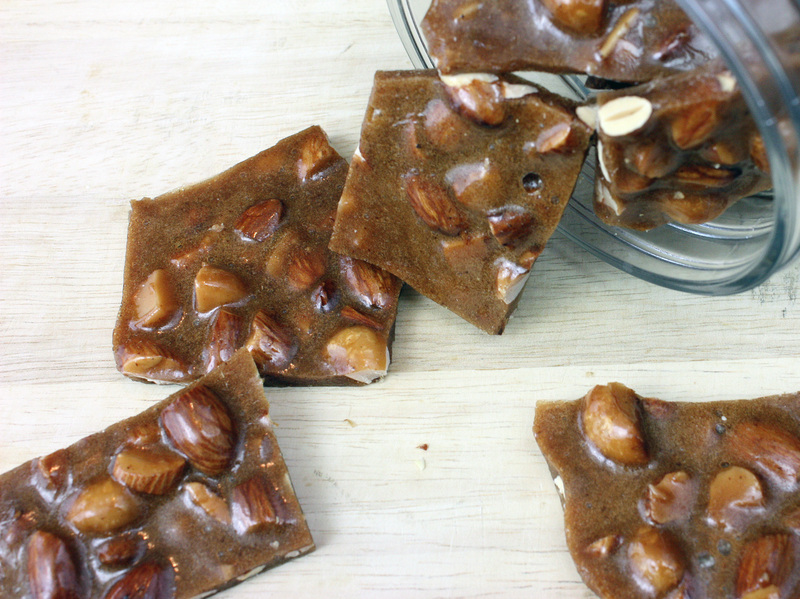 The first is a gluten-free, dairy-free, vegan macadamia almond brittle. It’s deliciously sweet, with caramel and cinnamon notes and that lovely brittle crunch. If you make it, you might want to make double, to compensate for the amount you “test”. It’s pretty addictive. 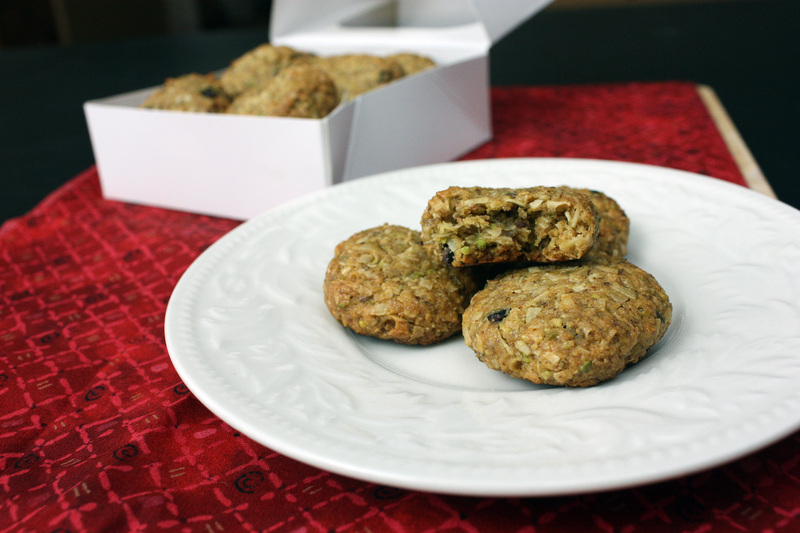 The second is a healthier, but equally delicious cookie – a gluten-free, vegan and sugar-free pistachio coconut macaroon. This cookie is chewy, lightly sweet, nutty, and full of coconutty flavor. Also pretty darned addictive. Both of these make excellent gifts, and would ship well without turning into crumbs, as many gluten-free cookies do. And just in case you forgot, I also shared some nut truffles (chocolate cherry, pecan pie and pistachio sesame) that would make excellent gifts as well. (however, they might not be as easy to ship, as they prefer to be chilled.) Of course, I can’t wait to see what ideas you share! Line a baking sheet with a silicone baking mat or buttered parchment paper (or spray the sheet with cooking spray). Set aside. In a small skillet over medium heat, lightly toast the macadamia nuts and almonds until just beginning to color. Remove and roughly chop. In a small bowl, combine nuts with cinnamon and salt. Set aside. Brush oil all over the inside of a medium saucepan. In the saucepan, combine sugar and water. Bring to a boil over high heat, stirring occasionally, and then cover with lid and allow to cook undisturbed for 3 minutes. Remove lid, turn heat down to medium, and stir. Place a candy thermometer in the saucepan, and allow to cook, stirring occasionally, until mixture reaches 265 degrees. Add nuts and coconut oil and continue to cook, stirring occasionally, until mixture reaches 295 degrees. Remove from heat, add baking soda and almond extract and stir vigorously. Turn out onto the baking sheet and spread out quickly with the spatula, making the brittle even and ensuring the nuts are even as well. Allow to cool completely, and then break into pieces. Preheat oven to 350 degrees. Line a baking sheet with parchment paper or a silicone baking mat. Set aside. In the bowl of a food processor, add pistachios, coconut flour, flaxseed meal, and salt. Process until mixture resembles a nut meal (no pieces should be larger than a sesame seed). Add coconut and pulse once or twice to combine. In a small saucepan, melt coconut oil and almond butter over medium heat. Remove from heat and add agave nectar and extracts. Stir in the pistachio-coconut mixture cocoa nibs. Using a small spoon, scoop and roll small balls of dough, about 1 ½ inches in diameter. Place on the prepared baking sheet and flatten with the palm of your hand. Bake for 11 minutes or until edges become golden brown. Allow to cool on baking sheet. Makes 12-16 cookies. Store in an airtight container. Okay, now it’s time for the giveaways! 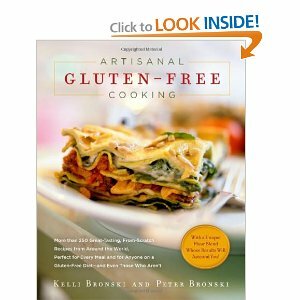 The first giveaway is for 2 copies of Kelli Bronski and Peter Bronski’s Artisanal Gluten-Free Cooking. Kelli is a trained chef, and Pete loves being in the kitchen as well. Together they created this cookbook, which has amazing recipes for everything from naan, pies, main dishes, and even ice cream. (They also have a great blog – No Gluten, No Problem – that shares wonderful food and information.) Even that lasagna on the cover has me drooling. This is certainly a book on my wish list! 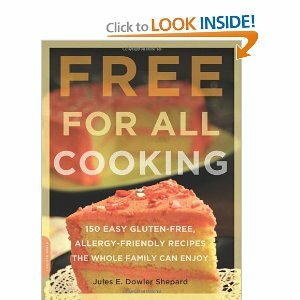 The second giveaway is for 5 copies of Jules E Dowler Shepard’s Free For All Cooking: 150 Easy Gluten-Free Allergy-Friendly Recipes the Whole Family Can Enjoy. If you’re looking for recipes that address multiple food intolerances or allergies, this is definitely a tool worth having. The book boasts 125 recipes that are free from ﻿gluten, dairy, eggs, nuts, soy, and more, and they are kid-friendly. – Link up a gluten-free edible gift recipe via the linky at the bottom of this post and leave a comment telling me what you’ve shared. – Post about this giveaway on your blog or Facebook and leave me a comment telling me that you did. – Subscribe to Tasty Eats At Home in a reader or in email, and leave a comment to tell me that you did so. – Follow Tasty Eats At Home on Facebook. – If by chance you have already read or purchased a copy of either book, leave an Amazon review for the book and leave a comment telling me you did so. Next week is Thanksgiving, so we will have a week off from Gluten-Free Holiday. But the week after (December 2), Diane at The W.H.O.L.E. Gang will be sharing favorite Christmas and Hanukkah Entrees and Sides. Be sure to visit and link up your favorites for more chances to win great cookbooks! Link up your favorite gluten-free gifts via the link below. Sometimes, you just gotta have some chocolate. I know I’m not alone in this. I mean, they wouldn’t have created the term “chocoholic” if there weren’t a lot of us around with that intense, gotta-have-some, deep-down desire for chocolate. Good thing there is a chocolate for every type of chocolate craving. Sometimes, I crave a pure, dark chocolate – with its bitter, complex flavor, and just enough smoothness, so that I can enjoy a single piece, close my eyes, and enter pure chocolate bliss. A nice bar of Valrhona or Scharffen Berger will do the trick. But other times, I prefer a sweeter treat – something with a variety of textures and flavors – including nuts, fruits, and milk chocolate, rather than dark. However, a Snickers bar just won’t cut it. That’s where these come in. 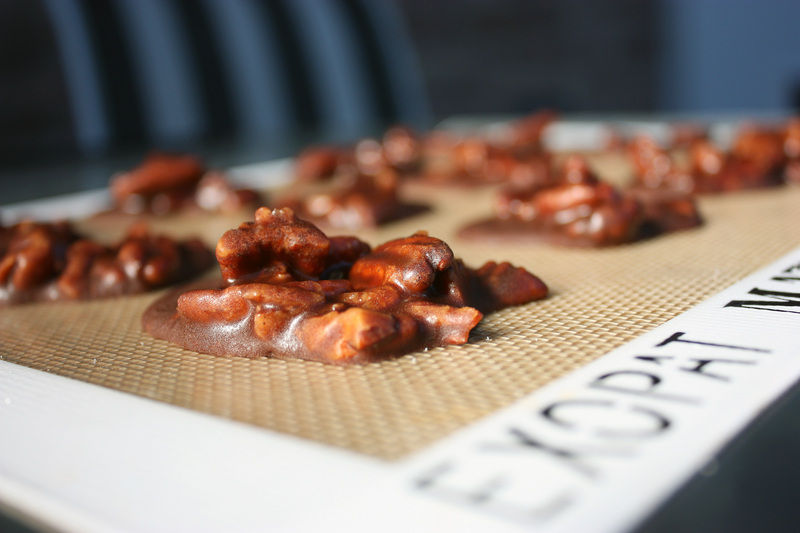 Mexican Chocolate Pecan Pralines. First, let me explain to you – pecan pralines are one of my favorite candies. Sweet and buttery, with one of the best nuts known to man, a good pecan praline can cause my eyes to roll back and my knees to go weak. So when I came across a recipe at Homesick Texan that combined Mexican chocolate with a pecan praline? It just about blew my mind. Lisa has a knack for causing me to become giddy with excitement over a lot of her recipes, but these definitely were at the top of the list. I’ve made them twice so far, following her recipe exactly both times. I can’t think of a thing to change. She discusses adding bacon in them, and while this sounds like it’s worth a try, I am happy with these as written. They’re perfect. The cinnamon and that bit of cayenne add a touch of heat that warms the back of your throat. The orange zest brightens the pralines, keeping them from being too rich or heavy. The texture is still very much like a praline – just slightly soft when you bite into them. While I am fully anticipating making a batch or two of these at Christmas, I don’t suggest waiting until then. These are too good to relegate just to the holidays! As I haven’t modified Lisa’s recipe at all, rather than writing it out here, I’ll just send you her way. While you’re there, check out her other delicious creations. If you haven’t experienced all of the wonderful culinary creations that are Texas, she can definitely lead you on the right path! Before you think me a “Grinch”, I thought I better get to it and crank out some Christmas goodies. It’s not that I didn’t have intentions to make these sooner – it was simply that like so many of us this time of year, I was swamped with holiday tasks. But finally, all of the presents are wrapped, and the shopping for Christmas dinner is finished. Today was for cookies. I narrowed down my never-ending list to 6 goodies – and I managed to crank out 5 of them. These are the two best recipes from today’s efforts – and I’ve already eaten so much of both, I doubt I will need sugar again for a week. They’re addictive, I tell you. The first is a toffee. 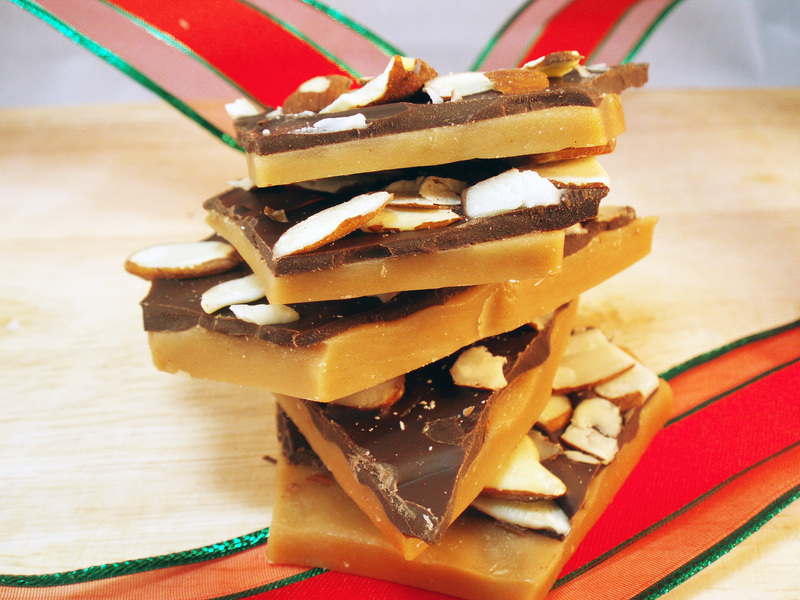 Toffee is one of my favorite candies – and at the risk of blasphemy, I love it even more than chocolate. This toffee, though, not only has buttery, caramel-y goodness, it’s also topped with chocolate and sliced almonds. Need I say more? I will definitely be sharing this stuff, because if I leave it around the house, I’ll eat it all. No kidding. The second is a gluten-free ginger, molasses, and chocolate chip cookie. Ginger and molasses cookies are also among my favorites – they’re something I make every year. This year, I wasn’t about to let a little thing called a “gluten-free diet” interrupt this tradition. 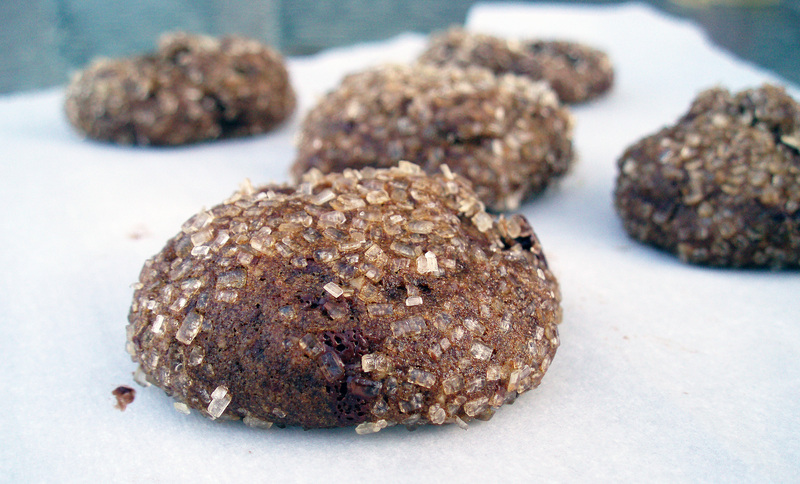 These are also kicked up a notch, with chopped bittersweet chocolate chips, both ground and freshly grated ginger, and rolled in turbinado sugar, so they sparkle. That sugar adds so much to the cookies – a bit of sweet crisp on the outside before the cookie gives way to a soft interior. Honestly? I don’t miss my old cookies – this version is superior in every way. If you have time left in your hectic holiday to squeeze in these delicious treats, I recommend that you do. Of course, the holidays aren’t the only time that these are welcome – personally, I’d be happy if these were shared with me anytime! Happy Holidays to you and yours. In a large cast iron skillet, melt the butter, water, sugar, and salt over medium heat. Stir with a wooden spoon constantly, trying to keep the sides of the pan clean. Once at a boil, continue to stir rapidly, until the mixture is a deep golden caramel color. Remove from heat and stir in vanilla. Pour mixture into a rimmed baking sheet lined with parchment paper. Allow to cool slightly, about 5 minutes, and sprinkle chocolate over the toffee evenly. Wait for another 5 minutes or until chocolate looks glossy, and with an offset spatula, spread chocolate out in an even layer. Sprinkle nuts over chocolate and lightly press in. Refrigerate for 3-4 hours or until firm. Break into pieces. Preheat the oven to 350 degrees. Line baking sheets with parchment paper. Place turbinado sugar in a small bowl and set aside. In a large bowl, whisk together the almond meal, teff, potato starch, xanthan gum, baking soda, ground ginger, and salt. Heat butter in a saucepan until just melted, and remove from heat. Add in molasses, brown sugar, and fresh ginger. If the mixture is hot, let it cool down a bit. It should be just a bit warm. Add the egg and whisk in. Pour this mixture into the flour and stir until just combined. Fold in the chocolate. Scoop out 1/2 tablespoon-sized balls of dough and roll in turbinado sugar. Place on parchment-lined baking sheets a few inches apart. Bake for 8-10 minutes or until the cookies have puffed up and are fragrant. Makes 4-5 dozen.